I-10 eastbound will be closed from 67th Avenue to around 35th Avenue ALL WEEKEND LONG! Heads up! 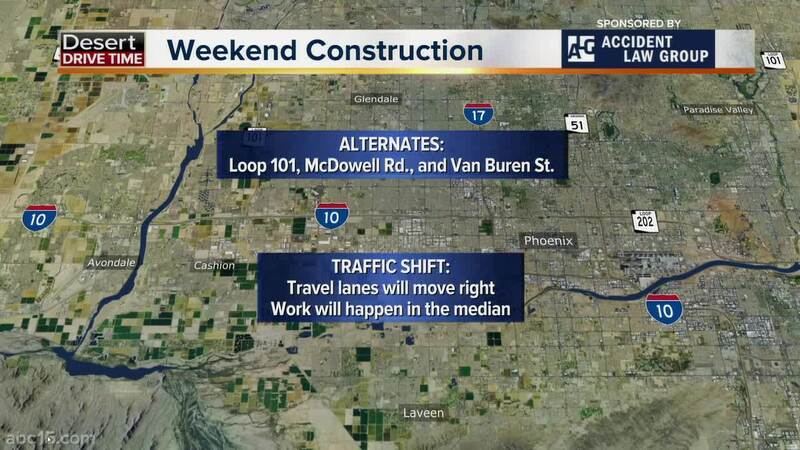 Several miles of of I-10 will be closed this entire weekend, as well as many on-ramps, due to construction for the Loop 202 South Mountain Freeway interchange. According to the Arizona Department of Transportation, I-10 eastbound will be closed from 67th Avenue to 35th Avenue, starting 9 p.m. Friday, Jan. 18. The end point of the eastbound closure is scheduled to be change from 35th Avenue to 43rd Avenue around noon, Saturday, Jan. 19, but the main lanes will remain closed through 4 a.m. Monday, Jan. 21. The eastbound I-10 on-ramps at 91st, 83rd, 79th and 75th avenues will also be closed to help reduce traffic backups, along with the eastbound I-10 access road between 67th and 51st avenues. Loop 101, McDowell Road and Van Buren Street can be considered alternate routes. Keep in mind, many travelers will use those options to avoid this traffic closure, so potential slow downs are possible. There will be traffic shifts, as the center median of I-10 will be under construction during the closure, with excavation, earthwork and paving. Crews will also be building the bridge structures for the HOV flyover ramps. Click here to see more information about this closure and project. In the West Valley, we were also told that I-10 will be closed westbound at Sarival Avenue. The ramp at Estrella Parkway will also be affected. A simple way to get around this closure would be taking the I-10 Frontage Road to Citrus Road to hop back onto the freeway. Here is more information on ADOT's Weekend Freeway Travel Advisory.